The company said it doesn't want to "sneak" app into businesses. A new business version of Evernote is now available in Australia, following its launch in the United States and six other countries in December. Evernote officials said at the launch event in Sydney today that Evernote Business gives IT managers control over a piece of cloud-based software commonly installed by their employees. It answers “a request from those users who bring their own device and bring their own applications into work,” said Evernote’s director of market development for APAC, Linda Kozlowski. “They wanted to have it more sanctioned at work. They wanted to be able to use it more officially at work. “But of course the barrier to that is then you have CIOs and CTOs” asking how to manage the information and how to maintain control of the organisation’s data, she said. Evernote does not build software for heads of IT, according to Evernote’s chief operating officer, Ken Gullicksen. “We don’t approach things as CIO down, but instead focus on the end users, who are typically the ones to bring Evernote into the workplace,” he said. IT managers’ main concern with Evernote had been data ownership, Gullicksen said. 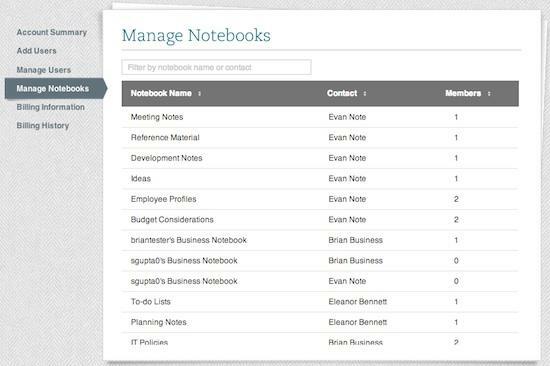 However, data ownership “really was a significant issue,” and Evernote sought to solve that problem by adding business notebooks to the software. In addition, only the administrator can permanently delete a note inside a business notebook, he said. Evernote does not data mine users’ notes for marketing or any other reason, said Kozlowski. Also, a company’s data remains its own even if it cancels its subscription, she said. Data can be exported into any format, she said. Evernote plans to enhance the software’s security by adding two-factor authentication “in the relative near term,” Gullicksen said. However, Australian businesses seeking to keep their data in Australia may need to look elsewhere. All user data stored in Evernote data centres is located in California, United States. Evernote's support team is also based in California, but will work during Australia business hours. While acknowledging that some Australian enterprises have raised data sovereignty concerns with cloud, Kozlowski said it’s less of a worry for smaller businesses, which are the most common users of Evernote. About 30 Australian customers have signed up for the business version ahead of launch, Gullicksen said. He couldn’t name the organisations but said they were mostly small businesses of under 100 staff, as well as a few local government bodies. “The interest in Evernote Business relative to the population of Evernote users in Australia has been quite a bit higher than elsewhere in the world,” Gullicksen said. Evernote officials said the company has 800,000 users in Australia, with an estimated two-thirds of that base using the note-taking app in the workplace. Gullicksen said he sees a particularly strong “entrepreneurial culture” with many small Australian businesses. Kozlowski added that strong broadband and smartphone penetration are also driving Evernote’s growth Down Under. Evernote eventually wants to reach large enterprises with its software, Gullicksen said. In the US, the company has started to sign up small groups within larger enterprises, he noted. Evernote Business costs about $10 per month per user, compared to $5 a month for the premium version. 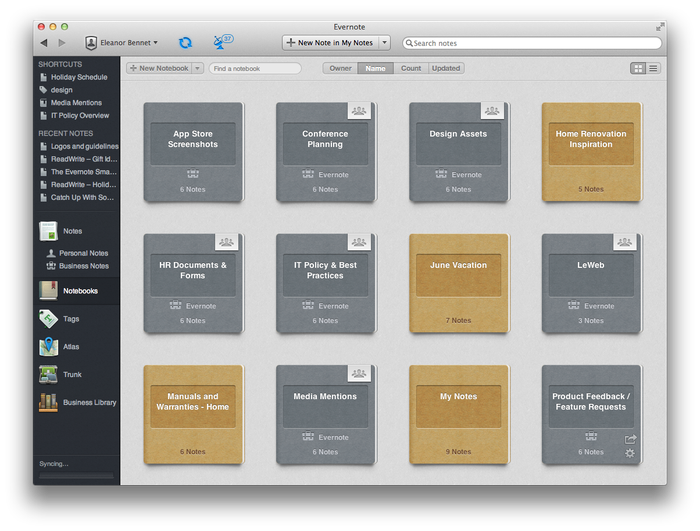 Evernote also offers a free version of its software for the basic consumer. The business flavour includes administrative and collaboration tools not found in other versions. In addition, each user in a business can upload 2GB of data per month, an upgrade from 1GB monthly in the premium version. Evernote is looking at adding more extensive version controls, Gullicksen said. While Evernote can automatically update attached documents in a shared note to the most recent version, the software currently does not store previous versions or show who has made changes to the file. Gullicksen said new Evernote partners, focusing on business users, plan to announce extensions soon. For example, LiveMinutes and UberConference will bring real-time collaboration tools to the mix, he said. Evernote may eventually integrate Evernote with Salesforce.com, he said.